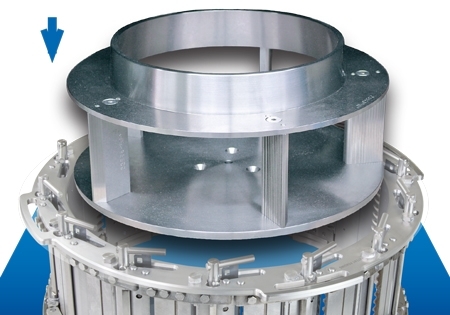 Urschel introduces a new slicing concept – meet the MicroAdjustable® Slicing Head (SL-14). 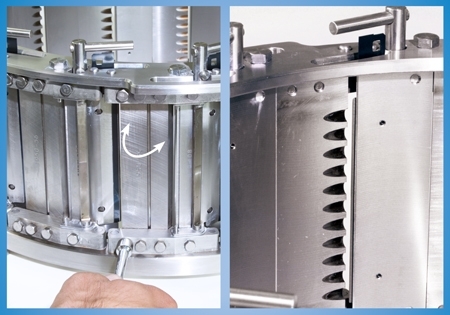 Urschel has long offered targeted cutting solutions to the global community of leading food processors — adapting to the requirements of individual applications and continuing to grow in the company's engineering and manufacturing expertise through each endeavor. 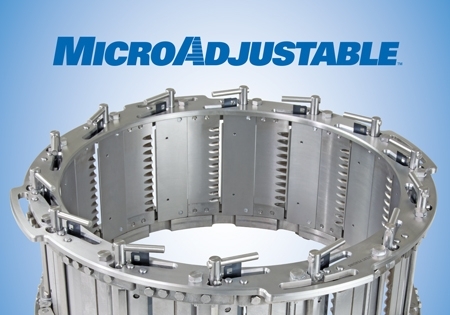 As a result of this adaptive cutting technology approach, Urschel introduces a new slicing concept — meet the MicroAdjustable™ Slicing Head (SL-14). The SL-14 is offered in two styles – one features micro-adjustability (A), while the other features micro-adjustability plus quick-clamping technology (B) to expedite knife changeovers. This 14-station cutting head offers nearly double the capacity of an 8-shoe head. The new design incorporates ideal, carefully crafted spacing of cutting stations to maximize slice engagement. The well-thought-out design carries through to every part and procedure and may limit use, reduce the need, or facilitate use of cut-protection gloves. In addition to the new SL-14 head, the standard, fully-adjustable slicing head containing an 8-shoe cutting station set-up is also still available. 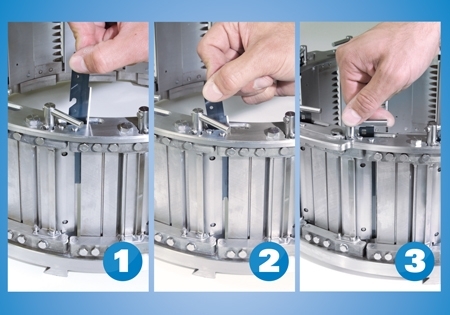 See the MicroAdjustable Slicing Head (SL-14) PDF brochure here. Learn more about Model CC here. Tool-free knife changeovers — with no fasteners or tools needed to remove and reinstall, and proven quick-clamping (patent pending) technology, changeovers are as fast or even faster than an 8-station head. 14 identical, ideally-spaced cutting stations maximize slice engagement to amplify productivity — almost double the capacity. Modular block design does not incorporate shims or shoes. At 35 lb (16 kg) with built-in lifting handles, the SL-14 is adeptly removed and replaced. 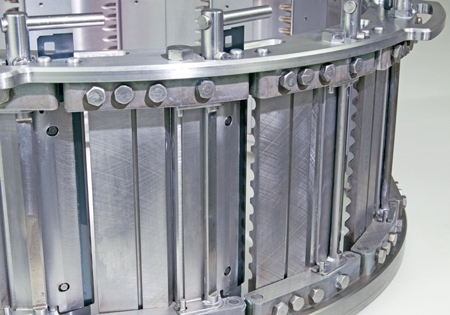 Stationary (fixed) knife poition — the knife holder and knife edge remain fixed during micro-adjustments and throughout production runs. Tool-free knife changeovers - quick-release clamping mechanism (patent pending) expedites changeovers – without tools or fasteners. Quick-set slice thickness with a simple turn of the adjustable screws. Maintains strict tolerances throughout production runs with the ability to easily micro-adjust slices using top/bottom adjustable screws by flexing the adjustable gate while the knife holder and knife edge remain in a fixed position. 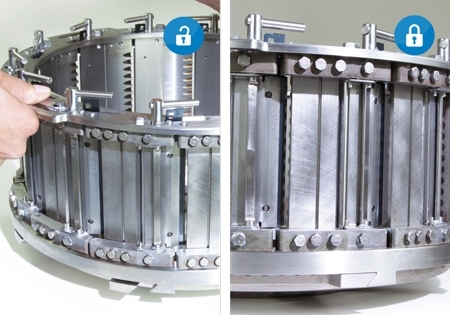 Fits in place of standard double-ring, double-adjustment heads using self-locking lower ring. No need for any special adapter. Uses standard impeller or new, optional grooved impeller. Different knives are available to extend runtimes, and reduce the number of knife changes. Specially crafted sanitary stainless steel knife features increased production longevity through greater durability, corrosive-resistance, and sharpening capability. Slice range: While the standard 8-shoe head offers a full-range of slice thickness adjustment up to .500" (12.7 mm), the new SL-14 offers simple, micro-adjustability in a range of .033" (.8 mm). Additional shapes and shreds in this new style head coming soon!